When our friends Junaid and Asma invited us to a neighborhood barbecue party, we knew we couldn't miss it because they make the world best grilled lamb-chops (as well as amazing grilled chicken), the Pakistani style. The challenge Junaid gave me was to come up with a wine match. I had just the answer! I stopped drinking Zins several years back, and only occasionally would pop one open for my friends who enjoy jammy California wines. That's why when I saw Gary Vaynerchuk rave about the 2005 Shifrin Howell Mountain Zinfandel on his show, I was intrigued, because I generally tend to agree with his "old world" palate. And given that he was running a "free shipping" promotion, I took a chance and ordered a bottle. The grilled lamb chops marinated in a variety of Pakistani spices finally gave me the excuse to try it. Right from the first sniff, this Zinfandel was different. The nose was almost Bordeaux-like - dry, a little funky, earthy, and peppery. A typical California Zin smells like an alcoholic jam. Not this one. The taste was full-bodied, dark fruit, peppery (almost syrah-like), dry, tannic but not gripping, nice acid, great balance -- completely unseen from any California reds I've tried (including from Howell Mountain), let alone a Zin! While we had other wines in the line-up (supplied by various neighbors) that paired decently with the grilled meat, including a Chianti, a Rioja, a Beringer Cab, and a full-bodied Steven Vincent Pinot Noir from Sonoma county, to me clearly this Shifrin Howell Mountain Zinfandel 2005 was a hands-down winner, and an eye-opener to what a good-old California Zin could be when certain restraint is maintained by the wine-maker. When I asked some of the guests to try it, one commented that it tasted aged (a complement in my book!) On his show, one of the key points that Gary Vaynerchuk made about this Zin is that it had the purity and "truthness" of fruit from the great Howell Mountain terroir. Personally, I am not sure that the wine was better because of that. I find lots of other terroirs in Napa and Sonoma counties that have great fruit. For me, what made this wine was: not over-oaking and not over-ripening that allowed the terroir of the Howell Mountain to come through. 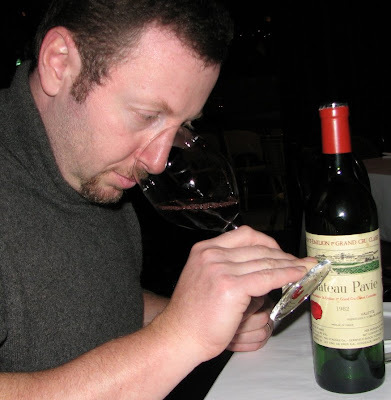 That's what I see lacking in vast majority of new-world wines (that makes them taste more like juice than serious wine). I want to order a couple of bottles of this stuff and add it to a blind-tasting line-up for my wine expert friends, and see if they get stomped! 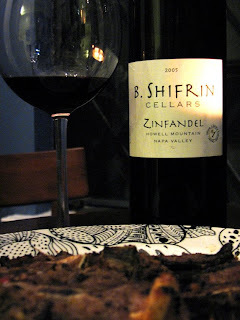 Congrats, Bobby Shifrin - you have brought Zinfandel back from the dead for me. Last night I skipped Jon. Jos. Christoffel Erben Riesling Spatlese, 2005, in the line-up at Vin Vino Wine. Today, I took out a bottle of the 2004 Kabinett version of the same producer and the same vineyard to wash down some Chinese food my wife cooked up for dinner. She made basa fish fillet in spicy sour pickled cabbage soup, and sweet-and-sour lotus root. The food was amazing. The wine - NOT. Same impression as from the line-up last night -- thick apple wine cooler. A lot of apple juice and grape juice flavor, some minerality, almost no petrol / rubber tire (which perhaps would come with aging). 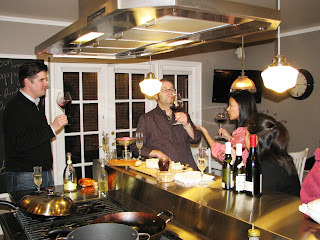 The wine was fat, flabby and not refreshing, failing to extinguish the spice in the food. The moral of the story for me? Don't take your Riesling for granted -- so far it seems most of them do not deliver! 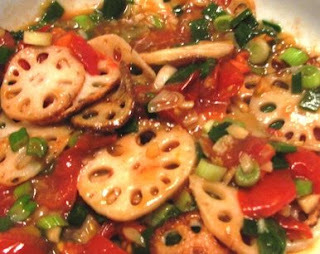 The food was great though, especially the lotus root with tomato-ginger-garlic sauce! She is good. 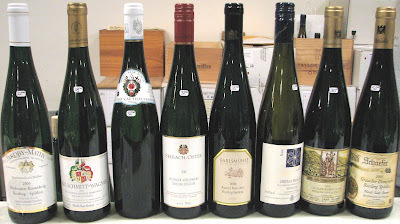 Just back from a 2005 and 2006 German Spatlese Riesling wine tasting at Vin Vino Wine wine shop in Palo Alto. For those not very familiar with Rieslings, they come in 6 levels of sweetness - #1) kabinett - the least sweet; #2) spatlese; #3) auslese (typically this and further levels are dessert wines); #4) beerenauslese; 5) trockenbeerenauslese; and finally 6) eiswein (ice wine). The prices start at kabinett and progress upwards toward the sweeter wines. After having had a very nice spatlese (1996 Bert Simon Spatlese Serriger Wurtzberg) several days ago at a neighbor's all-boys night, naively I was expecting similar goodness out of the entire line-up today. 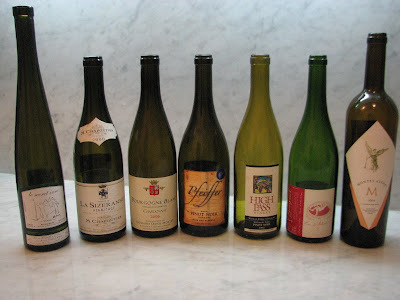 After having tried 7 wines tonight, boy, was I unimpressed. All but one tasted like varying degrees of apple cider, mostly cloying and flat. (To be fair, I skipped Jon. Jos. Christoffel - #7 in the line-up, since I already have it in my wine cellar). Of the rest, the only one I liked (really liked!) 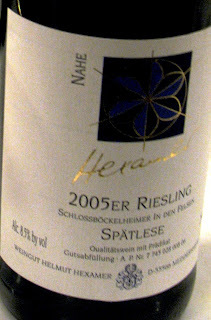 was Hexamer Schlossbockelheimer In Den Felsen Riesling Spatlese, 2005, which had excellent spritzy minerality, very good acidity and the least amount of sugar. Which begs the question for all of you experts out there -- why pay extra for Spatlese wines when Kabinetts cost less and have more refreshing taste?!!! 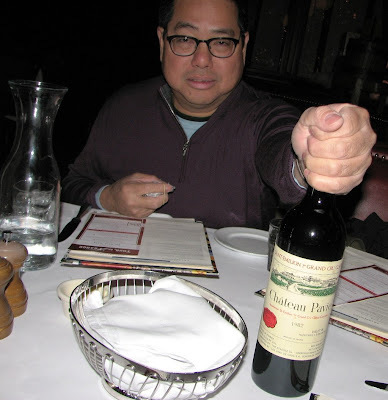 Tonight my wife and I had the pleasure of dining with Alex Bernardo, the owner of Vineyardgate wine shop in Millbrae, who brought a bottle of 1982 Chateau Pavie from his stash. Chateau Pavie, of course, is one of the great chateaux in Bordeaux, from what's known as the "the right bank" in the commune of St. Emilion. This chateau is classified as Premier grand cru classé B level. 1982 was one of the top vintages of the 20th century for Bordeaux, and this wine did not disappoint, as even after 26 years it was still going strong, but ready to drink now. The fruit was a combination of sour black cherry and blackcurrant, a bit of pickle, cured meat and tartar sauce (due to aging), a bouquet of autumn (as Alex summed it up, reflecting upon the wine's age and the images it evoked in his mind). The wine was medium bodied and elegant, with good fruit still coming through, accompanied by some pleasant earthiness, gaminess and herbaceous note, though it did not seem to have the tobacco that I often admire in a Bordeaux. As most wines from the right bank, this one is primarily made from Merlot grape, with some Cabernet Franc and Cabernet Sauvignon added. It was only 12.5% alcohol, which made it easier to drink -- lower level of alcohol was typical for that era of wine-making, and is significantly lower than today's powerhouse Bordeaux (not to mention Napa Valley reds). 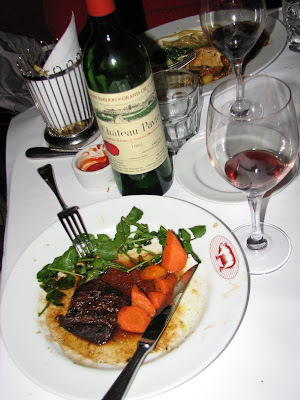 The wine paired perfectly with the juicy medium-rare skirt-steak sprinkled with Bordelaise sauce, complemented by sauteed carrots and fresh watercress. This Pavie reminded me once again why an aged Bordeaux is so much more pleasurable than every other California "Bordeaux blend" I've ever tried. The toned-down flavors reflected the quiet confidence and class of an old-world gentleman, while the great acidity of the Bordeaux elevated the good old boring steak to a gastronomic delight. And of course, Alex's and his wife's company made the whole affair extra special. And to think - this wine was made in 1982, when I was just entering middle school as a young soviet pioneer in Odessa (Ukraine), crying over Brezhnev's death, completely unaware of what was going on St. Emilion :)! But what were YOU doing in 1982? 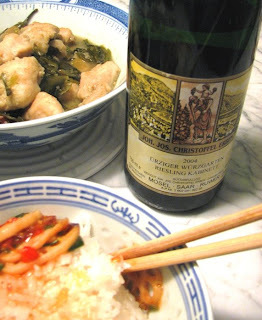 Just wanted to once again point out how great German Rieslings are with Chinese food. 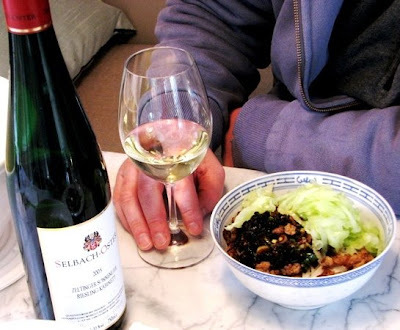 My wife cooked a best-ever dan dan noodle for lunch, and gave me another excuse to pop a Riesling I had not tried before - Selbach-Oster Kabinett, 2005, from Zeltinger Sonnenuhr vineyard in Mosel. The noodle was amazing - mixed with home-made spicy chili oil, preserved mustard greens, fried ground pork, shredded cucumber (personal touch from my yard), and home-roasted and ground sichuan pepper, and half dozen salty, sour, savory sauces, including sesame oil. The wine was a disappointment unfortunately. Although it tasted like a typical Riesling, full of apple, peach, a little tangerine, minerality, rubber tire and petrol -- it was rather flat, and lacked the focus and brightness I tasted in other German Rieslings. Still, it made an amazing complement to the spicy sichuan dish. The sweetness calmed the heat, and the acidity (though somewhat lackluster in this particular wine) refreshed the palate. Granted, for $20 it is a lot more expensive than a beer, but so much more interesting and delightful! Hello Poggio Belvedere from Umbria - good-bye Chianti! Just had 2005 Poggio Belvedere by Ardnaldo Caprai from Umbria (Italy) for the first time - 80% Sangiovese, 20% Ciliegiolo. I picked it up from Alex Bernardo over at Vineyardgate in Millbrae - one of my favorite wine shops in the Bay Area (talking to Alex is always a fun and educational experience, but that's a subject for another post). Normally, I wouldn't pay much attention to yet another Italian red, but this time Alex snuck it into his Saturday tasting line-up. The wine is only $13 (i.e. 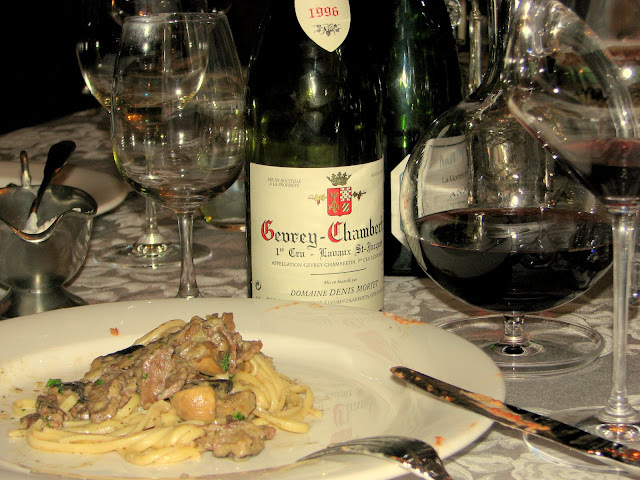 a type of wine one can afford with an everyday meal), and it was an amazing match to the food. I had it with pasta and prawns in red sauce (with garlic and herbs from my garden). Typically, I would have a Chianti (or maybe a Montepulciano d'Abruzzo) with this type of food. In a Chianti, as in most inexpensive Italian reds I try, one would see a ton of acidity dominating the fruit. But this fresh light-to-medium body wine was singing as a perfect duo of juicy fruit and zingy acidity, and had very soft tannins. The flavor had similar profile to Chianti - combination of red and black berries, dominated by sour cherry, but less earthy. It is made with no oak, so that must have contributed greatly to the purity and freshness of the fruit expression in it. It was delicious and aromatic, and almost seemed like it was enhanced with grape, peach, or orange juice (perhaps the effect of ciliegiolo), which reminded me of the way that the French add viognier to syrah in Northern Rhone, particularly in Cote-Rotie, to enhance the taste of the primary grape - the syrah). Move over, Tuscany. Go Umbria! Last night I prepared an ex-Soviet themed dinner for our non-Russian friends, trying to open their palates to some traditional and very good Russian, Ukrainian, Jewish, and Central Asian foods. Sausages and kvas (drink made from rye bread) for pre-dinner snacks, Borscht (cabbage and beet soup), pickled veggies and two kinds of pilafs - lamb and beef - for main course, and sour-cherry filled blintzes for dessert. 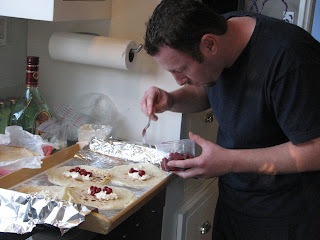 That's me on the photo, painstakingly filling the blintzes. Which of these wines do you think paired best with the main course? Well, actually none paired great. The 2007 "La Dilettante" Bourgueil from Domaine Breton (second bottle from the right) tasted a bit like beer and pickles, so it went well with the pickled veggies (cabbage, beans, tomatoes, peppers, eggplant). And the 2000 "La Sizeranne" Hermitage from M. Chapoutier (second from the left) was the best match for the slightly sweet and pungent Central Asian (Uzbek + Afghan style) pilaf, though still the Hermitage was bigger and drier I would have preferred for an ideal match. Russian food - tough pairing with wine (and you wonder why they drink vodka!) - but we'll keep looking!